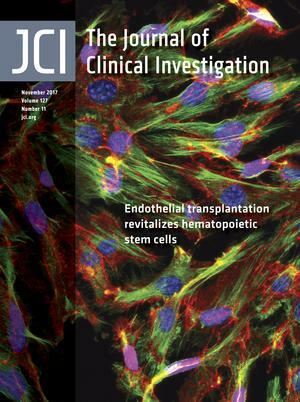 In this month’s JCI, Poulos et al. reveal that the age of bone marrow endothelial cells (BMECs) strongly influences hematopoietic stem cell characteristics. Whereas aged endothelium imparted an aging phenotype to young hematopoietic stem cells, young endothelium rescued many of the deficits observed in aged cells. In the cover image, upregulation of ROS (magenta) represents one age-related defect observed in older BMECs (visualized in red and green with blue nuclei). Image credit: Michael Gutkin. Citation Information: J Clin Invest. 2017;127(11):3918-3920. https://doi.org/10.1172/JCI97042. Citation Information: J Clin Invest. 2017;127(11):3921-3922. https://doi.org/10.1172/JCI97707. Citation Information: J Clin Invest. 2017;127(11):3954-3969. https://doi.org/10.1172/JCI93817. Citation Information: J Clin Invest. 2017;127(11):4018-4030. https://doi.org/10.1172/JCI92464. Escherichia coli and other Enterobacteriaceae are among the most common pathogens of the human urinary tract. Among the genetic gains of function associated with urinary E. coli isolates is the Yersinia high pathogenicity island (HPI), which directs the biosynthesis of yersiniabactin (Ybt), a virulence-associated metallophore. Using a metabolomics approach, we found that E. coli and other Enterobacteriaceae expressing the Yersinia HPI also secrete escherichelin, a second metallophore whose chemical structure matches a known synthetic inhibitor of the virulence-associated pyochelin siderophore system in Pseudomonas aeruginosa. We detected escherichelin during clinical E. coli urinary tract infection (UTI) and experimental human colonization with a commensal, potentially probiotic E. coli bacteriuria strain. Escherichelin production by colonizing enterobacteria may help human hosts resist opportunistic infections by Pseudomonas and other pyochelin-expressing bacteria. This siderophore-based mechanism of microbial antagonism may be one of many elements contributing to the protective effects of the human microbiome. Future UTI-preventive probiotic strains may benefit by retaining the escherichelin biosynthetic capacity of the Yersinia HPI while eliminating the Ybt biosynthetic capacity. Citation Information: J Clin Invest. 2017;127(11):4042-4058. https://doi.org/10.1172/JCI90387. NK cells, lymphocytes of the innate immune system, are important for defense against infectious pathogens and cancer. Classically, the CD56dim NK cell subset is thought to mediate antitumor responses, whereas the CD56bright subset is involved in immunomodulation. Here, we challenge this paradigm by demonstrating that brief priming with IL-15 markedly enhanced the antitumor response of CD56bright NK cells. Priming improved multiple CD56bright cell functions: degranulation, cytotoxicity, and cytokine production. Primed CD56bright cells from leukemia patients demonstrated enhanced responses to autologous blasts in vitro, and primed CD56bright cells controlled leukemia cells in vivo in a murine xenograft model. Primed CD56bright cells from multiple myeloma (MM) patients displayed superior responses to autologous myeloma targets, and furthermore, CD56bright NK cells from MM patients primed with the IL-15 receptor agonist ALT-803 in vivo displayed enhanced ex vivo functional responses to MM targets. Effector mechanisms contributing to IL-15–based priming included improved cytotoxic protein expression, target cell conjugation, and LFA-1–, CD2-, and NKG2D-dependent activation of NK cells. Finally, IL-15 robustly stimulated the PI3K/Akt/mTOR and MEK/ERK pathways in CD56bright compared with CD56dim NK cells, and blockade of these pathways attenuated antitumor responses. These findings identify CD56bright NK cells as potent antitumor effectors that warrant further investigation as a cancer immunotherapy. Citation Information: J Clin Invest. 2017;127(11):4059-4074. https://doi.org/10.1172/JCI94585. Citation Information: J Clin Invest. 2017;127(11):4090-4103. https://doi.org/10.1172/JCI92876. Shwachman-Diamond syndrome (SDS) (OMIM #260400) is a rare inherited bone marrow failure syndrome (IBMFS) that is primarily characterized by neutropenia and exocrine pancreatic insufficiency. Seventy-five to ninety percent of patients have compound heterozygous loss-of-function mutations in the Shwachman-Bodian-Diamond syndrome (sbds) gene. Using trio whole-exome sequencing (WES) in an sbds-negative SDS family and candidate gene sequencing in additional SBDS-negative SDS cases or molecularly undiagnosed IBMFS cases, we identified 3 independent patients, each of whom carried a de novo missense variant in srp54 (encoding signal recognition particle 54 kDa). These 3 patients shared congenital neutropenia linked with various other SDS phenotypes. 3D protein modeling revealed that the 3 variants affect highly conserved amino acids within the GTPase domain of the protein that are critical for GTP and receptor binding. Indeed, we observed that the GTPase activity of the mutated proteins was impaired. The level of SRP54 mRNA in the bone marrow was 3.6-fold lower in patients with SRP54-mutations than in healthy controls. Profound reductions in neutrophil counts and chemotaxis as well as a diminished exocrine pancreas size in a SRP54-knockdown zebrafish model faithfully recapitulated the human phenotype. In conclusion, autosomal dominant mutations in SRP54, a key member of the cotranslation protein-targeting pathway, lead to syndromic neutropenia with a Shwachman-Diamond–like phenotype. Citation Information: J Clin Invest. 2017;127(11):4104-4117. https://doi.org/10.1172/JCI93437. Citation Information: J Clin Invest. 2017;127(11):4124-4135. https://doi.org/10.1172/JCI94495. Citation Information: J Clin Invest. 2017;127(11):4136-4147. https://doi.org/10.1172/JCI94912. Citation Information: J Clin Invest. 2017;127(11):4148-4162. https://doi.org/10.1172/JCI83626. Citation Information: J Clin Invest. 2017;127(11):4179-4192. https://doi.org/10.1172/JCI91258. Citation Information: J Clin Invest. 2017;127(11):4207-4215. https://doi.org/10.1172/JCI96036.